07:45 – There is a “professional” photographer on site this morning, a guy with a Nikon and a portable photo printer. Jen, Paula’s counterpart, pulls me aside to ask me to take a picture with her and her daughter Melody. Americans pay large portions of their incomes for luxury cars, designer clothes, and lavish vacations. 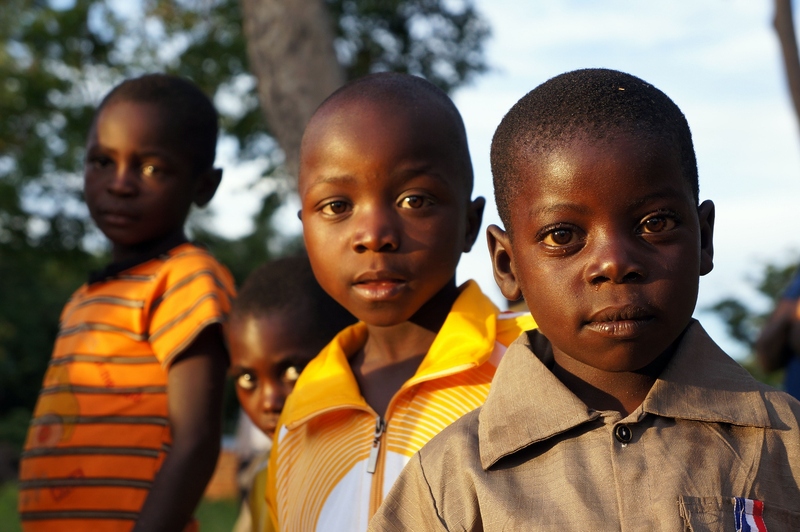 Zambians pay large portions of their incomes for photographs of family and friends. I think there are lessons I am still learning about what is actually important in life. 08:02 – We board the minibus taking us to the bus station. Most of us. Hilda, Holly’s counterpart, jumps off to take a picture. Sebastian follows. Everyone groans, and the driver eventually shifts into first gear and rumbles off, forcing Sebastian and Hilda to run to catch up with the bus. 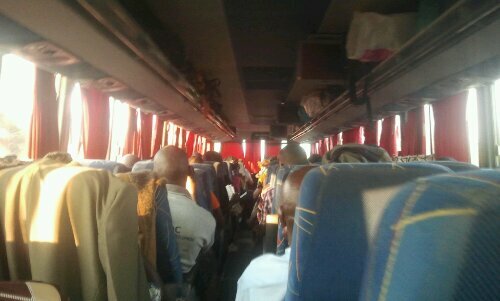 09:10 – We arrive at the Lusaka Intercity Bus Terminal. This place is a zoo. Sebastian, Ba Daniel (Lucas’ counterpart), Ba Maxim (Chris’ counterpart), and I fight our way through hordes of ticket sellers and buy tickets on the 15:00 Juldan bus to Kashikishi. 09:34 – We have time to kill so I decide a field trip to America is in order. We walk two blocks to Levy Junction, a modern indoor shopping complex that looks exactly like every big mall in suburban America. There I play tour guide, explaining all of the different sights to the dutifully awed and impressed counterparts. 11:12 – The boys need to do some shopping at a place where a shirt doesn’t cost as much as four months’ worth of food for a family of eight in the village, so we trek over to Kamwala Market. There could not be two more opposite places within two blocks of each other. Levy Junction is polished, immaculate, and smells like money and air conditioning. Kamwala Market is dirty, sprawls between derelict buildings and defunct railroad tracks, and smells like what money purchased, consumed, and regurgitated onto the muddy road six days ago. 12:23 – Still browsing the market. And I thought I was a big shopper. I poke my head in various shops looking for interesting football jerseys but don’t find any. 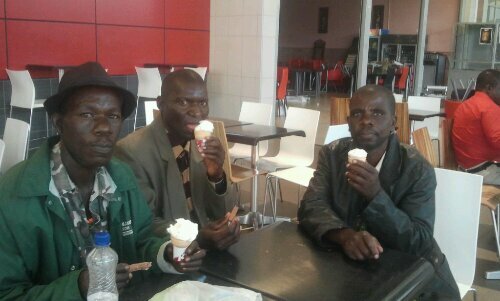 Meanwhile, I follow three short Zambian men as they buy blankets, little girls’ dresses, electricity inverters, teenaged boys’ shoes, chitenges for first wives (second wife got the blanket), and those interesting electronic gadgets which never end up working but which also never fail to appeal to men everywhere. 13:46 – Back at the bus station. 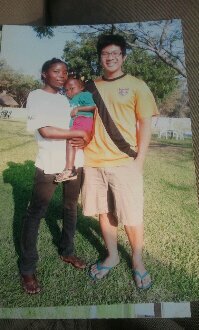 Eric, a RAP ’11er from Northern, and his younger sister visiting from the States arrive; they’re taking the 15:00 Juldan to Kasama en route to visit his site. Erica, CHIP ’12 and one of our trainers for the PEPFAR workshop, joins us a bit later and we chat until it’s time to board our separate buses. 15:19 – Ba Sebastian and I have the entire back row of the bus to ourselves. If we’re not joined by anyone else, we’ll have a very comfortable ride. 17:39 – In Kabwe. No more private back row. Oh well. 19:01 – We’re stopped in Kapiri for a bathroom and snack break. Sebastian opens a soda and it explodes all over him. The 40-year-old man sitting across from me wearing pants that were only in style with teenaged girls in the 70’s clambers off to buy a loaf of bread for the woman in the seat next to him so that she can stay on the bus with her baby. When she tries to pay him back, he shrugs her off and tells her not to worry about it. I resolve (again) to try to be a better person. 20:33 – I switch the Kindle off (David Brooks’ The Social Animal, 72% completed) and push the earbuds in. Ready for some electropop from Lorde. 21:02 – Have listened to “Tennis Court” and “Royals” on loop for the past half hour. Now ready to start trying to sleep. 02:15 – In Samfya boma. I sneak off into some nearby bushes to empty my bladder for the first time in six hours. Daniel and Maxim prepare to disembark at the next stop. Only five more hours to go until I’m back home. 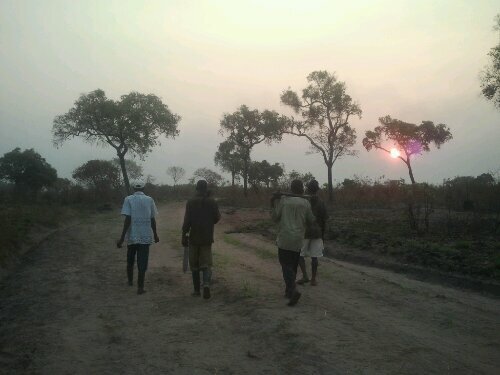 03:38 – We arrive in Mansa. Sebastian buys a loaf of bread from a street vendor who tosses it up through the open window of the bus. The five-kwacha bill Sebastian floats down to the bread seller is somehow lost. We spend the next ten minutes searching the ground with our cell phone lights as Sebastian and the bread vendor argue chippily back and forth. Sebastian finally withdraws his head from the window and slams it shut, announcing that it is the fault of the other man and not his own. 06:33 – We arrive in Mwense boma. Not far now. Sebastian tells me that he will get off the bus in Shanyemba, where his first wife lives, so that he is not seen arriving in Nshinda with me and perhaps prompting people to think that he has been given lots of money. 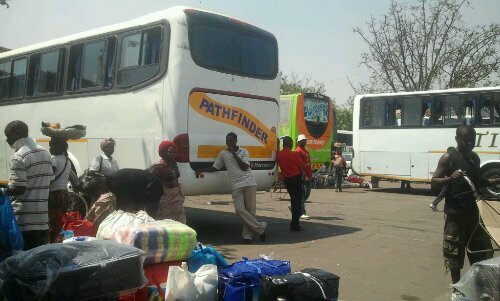 08:29 – Always expect the unexpected when it comes to transportation in Zambia. Our bags are at the back of the hatch, so the conductors won’t let us access them until they reach Kashikishi at the end of the road. 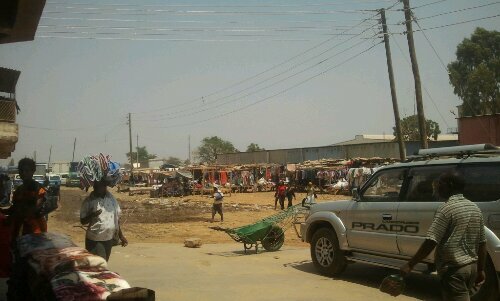 Passing Nshinda as I write this. 09:59 – Sitting outside a restaurant called Refreshment Centre in Kashikishi, waiting for another Lusaka-bound Juldan bus to take Sebastian and me back down to Nshinda. At least I got to do my grocery shopping. I strike up a conversation with an elderly Congolese gentleman passing through Kashikishi from one province in the DRC to another. He knows French, Swahili, and Bemba. I know English, some Spanish, and some Bemba. It’s a struggle, but we muddle through. 11:03 – Back at site, at last. I’m hot, sticky, haven’t bathed in two days, and have been stewing in my own sweat the entire time. The bus dropped me off in front of the school just as classes let out, so any pretense I might have entertained about arriving unnoticed was quickly vanquished. Still, I don’t think I’ve ever felt happier to hear the choruses of “Ba Matt, Ba Matt!” or to argue with my perpetually disgruntled kitten. It’s good to be home. It just got dark. The village all around me is alive with the sounds of children playing and laughing, women calling across to one another, men returning from their fields, bicycles rattling by on the path outside my hut, chickens clucking, long-legged crickets chirping. The sounds of rural Africa. I had thought I would be alone in my village for two years. I had read that being in the Peace Corps would be mentally and emotionally isolating, and so I tried to mentally and emotionally prepare myself for isolation. But how wrong I was. I’m the farthest thing from being alone in my village. Every other person in the village is here too. Yes, I am the only American for a 6-kilometer radius. I’m starting to realize though that this is an arbitrary distinction based more on the set of criteria that I use to identify myself than on any inherent characteristics that I have. It’s this assumption, this inherent belief that my differences and not my similarities are what define me, that I’m trying to change in myself. That the Peace Corps as an institution is trying to change, I think, in both America and in countries across the world, one village at a time. It is a simple lesson but a resounding one: we are more alike than we can at first imagine. There’s a phrase in Bemba, cimo cine, which means the same, or the same thing. I use it surprisingly often considering that I live in a place where I am the most different person my neighbors have ever encountered for longer than the time it takes a car to zoom past the village, in a culture where men readily hold hands in public even though husbands and wives never touch each other during the day and I haven’t seen a bare thigh since Labor Day of last year. It actually comes out a lot in conversation with people when I’m trying to describe myself and have already said I’m not married and do not have children. Okay, so I don’t cook nshima and my Bemba stumbles along like an elderly man with a bum knee. (We both eventually get to where we want to go, but it takes much longer than it should and there’s a lot of gesturing involved.) But rather than noting my different skin tone, different hair texture and length, different eye shape, look instead at our similarities! I want to cry out, unsure whether it’s them or me who I really am trying to convince. Look as I walk along the same bush paths that you take to get to your fields, cook at the same time as your wife and sister and mother, on the same brazier they use, with the same charcoal. Observe that I draw water from the same well, buy the same tomatoes and the same cabbage from the roadside. Watch as we laugh at the same things, greet each other in the same manner, shield our eyes from the same sun, complain good-naturedly about the same heat, and then gripe about the same morning chill the next day. And begin to see, slowly, but certainly, that the product of our similarities is greater than the sum of our differences. To know that I am not alone here. To realize that we are cimo cine. We are, in the ways that matter most, the same. I looked down at the children crowded around our feet, glanced over at the men laying bricks for the foundation of the new house next door, looked past them at the women drawing water from the well. 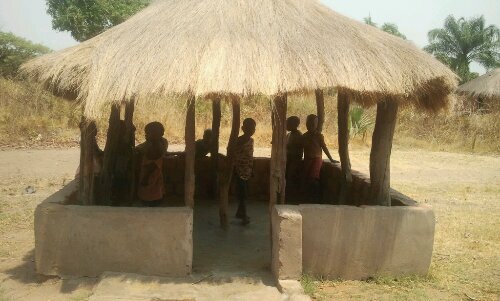 My well. Our well.